No chimneys here chez Isobel and Cat, so no Father Christmas squeezing onto the hearth and covering the carpet with soot, scoffing a hot mince pie and drinking a glass of sherry, before leaving a stocking full of presents hanging from the non-existent mantelpiece. But there was still a number of packages to open. Increasingly over recent years my friends and I have agreed to forgo the gift swapping and remove a large part of the stress in the run up to the Christmas period. Gifts we do exchange tend to be consumable, and the delicacies Maria sends me from Barcelona are very much part of my Christmas celebrations. Anyway, the number of gifts waiting for my attention on Christmas Day was not large. Which is what made it so odd that I managed to miss one of them until this evening. It was from Octavia and wrapped in very groovy paper. I picked it up, and as I took the paper off to reveal a brown cardboard box, and thought it was just the right sort of size to be a mug. Now mugs are something I have a lot of. I am rich in mugs. One thing I do not need is another mug. 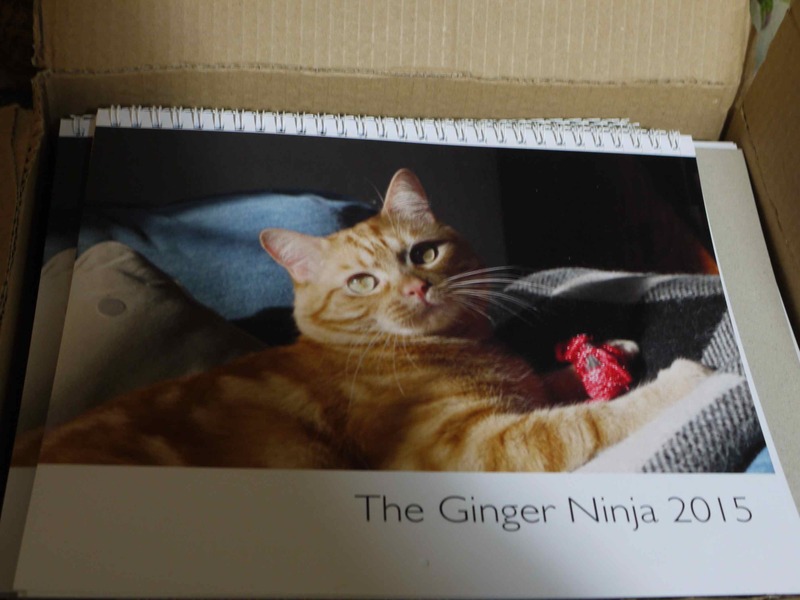 Ginger Ninja Calendars, Hurry While Stocks Last! The last few copies of the Ginger Ninja 2017 calendar are for sale. These are limited edition calendars for cat cognoscenti, and feature my cat MasterB, aka the Ginger Ninja . I have a few calendars still for sale. Three have crossed the pond and been received safely, a fourth is on its way. Two are in Belfast; one in Suffolk; ten have been reserved and will be handed over soon; six will have homes locally. Not sure that makes MasterB a global superstar just yet, but he’s working on it. CH just walked in with Master B’s calendar! Love it! Thank you Isobel!! !